Delhi Capitals (DD) won the 40th match of IPL 2019 against Rajasthan Royals (RR) by 6 wks at Sawai Mansingh Stadium in Jaipur. Jaipur, April 21 (IANS) Having secured a much-needed victory against Mumbai Indians, Rajasthan Royals will look to continue with the winning momentum against an in-form Delhi Capitals (DC) when the two..
Rajasthan Royals (RR) won the 36th match of IPL 2019 against Mumbai Indians (MI) by 5 wks at Sawai Mansingh Stadium in Jaipur. Rajasthan Royals won the toss and elected to field in the 36th match of IPL 2019 against Mumbai Indians at Sawai Mansingh Stadium in Jaipur. 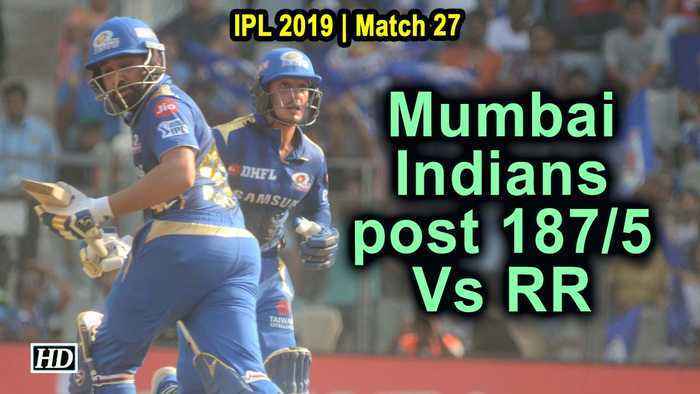 At the end of the Powerplay, Mumbai Indians had scored 46..
Rajasthan Royals are set to clash with Mumbai Indians in the 36th match of IPL 2019 at Sawai Mansingh Stadium on Saturday in Jaipur.